Berggruen Gallery is pleased to present Paul Kremer: Stacks, Slopes and Streams, an exhibition of recent paintings and works on paper by American painter Paul Kremer. This show marks Kremer’s first solo exhibition with the gallery as well as his first solo show on the West Coast. It will be on view August 9 through September 1, 2018. The gallery will host a reception for the artist on Thursday, August 9 from 5:00 to 7:00pm. Kremer is widely recognized for his striking acrylic paintings that explore and composition while proposing a graphical perception of various artistic styles, including Color Field and Minimalist painting. Sharply painted linear forms create dynamic bodes of work that are at once abstract and recognizable, serious and unpredictable. Kremer challenges the viewer to see everyday imagery—doorways, crevices, animals, mountain ledges, curtains—with subtle hints, allowing his audience to exercise individual perception. Simplifying painting to its basic elements, Kremer works in a limited yet vibrant palette of bold colors—often in specific hues of orange and blue. In this exhibition, he experiments widely with different blues while peripherally incorporating less frequently used shades of yellow and green. Kremer’s experimentation with color, shape, and form lends his work an iconic sense of aesthetic clarity and artistic purism reminiscent of Josef Alber’s color studies and the work of hard-edge painters such as Frederick Hammersley, John McLaughlin and Ellsworth Kelly. Kremer’s works do not adhere to a precise template or mode of creation. He experiments with form to create an animated and often playful sense of life. Unbroken planes of color are interrupted by the implied overlay of shapes, which create the illusion of objects submerged in water or obscured by shadows. The surfaces of Kremer’s paintings and works on paper are flat and matte, each work so evenly painted as if almost printed. However, paint dripping along the exposed edges of the canvas (a signature of Kremer’s work) reveals the hand of the artist and his method of applying paint. This relationship between clarity and ambiguity, precision and playfulness, abstract and concrete, lends Kremer’s work an aesthetic and thematic complexity that is at once iconic and contemporary, pushing the boundaries of art by expanding the possibilities of formal elements—form, color, line—to propose a uniquely bold and multifaceted translation of the outside the world. In this exhibition, three of Kremer’s most recent bodies of work—Stacks, Slopes and Streams—are highlighted. Each of these series allude to a new type of spatial depth that captures one’s attention and encourages viewers to look more closely. In the Stack paintings, multiple triangular forms extending from the right and left edges are layered atop one another, as if loose piles of transparent fabric or leaves of vellum are spread on a tabletop. The Slopes appear as depictions of shadows, whether cast from the setting sun on a hillside or from the curved edge of a sheet of paper. The Streams, while the simplest of them all in compositional structure, can be understood as the complex way in which light, shadow and depth of bodies of water are viewed from above. Whether a long lap pool or a levee, from an aerial perspective these waterways appear in array of shifting shades of blue—the darker shades may be the cast shadows from the embankment or concrete side, or perhaps greater depths in the water, while the lighter shades may be sunlight reflecting off the shallow depths. However, as in all his work, Kremer does not prescribe a way of understanding. Rather, he provides prompts and possibilities—often the titles of the works themselves—that enhance the viewer’s imagination and interpretation, encouraging a deeper way of seeing. 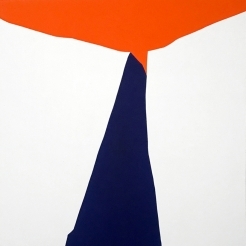 A self-taught artist, Paul Kremer was born in Chicago, Illinois in 1971. For twenty years he owned a graphic design studio, where he worked with such clients as Lou Reed, Tom Waits, MTV, PBS, and National Geographic. He was also a founding member of the art collective I Love You Baby, which was active from 1998 to 2008. Kremer has since become a full-time artist. Recent solo exhibitions include Lean Mechanics, Eugene Binder, Marfa, Texas; Base Zones, Sorry We’re Closed, Brussels; Hometown Bait, Pablo Cardoza, Houston; and Dad’s Garage, Makebish, New York. Kremer lives and works in Houston, Texas. Paul Kremer: Stacks, Slopes and Streams, August 9 – September 1, 2018. On view at 10 Hawthorne Street, San Francisco, CA 94105. Images and preview are available upon request. For all inquiries, please contact the gallery by phone (415) 781-4629 or by email info@berggruen.com.